Well, it has been a very busy few days since we last spoke, lots of racing. We have a few new members of staff, who are settling in well and seem to be getting on really well. We would like a couple more good riders who are willing to join the mad house! On non-racing days there are lots of people, but being a very small yard on race days when at least 2/3 have gone it makes a lot more work for those who are left! Yesterday, to add to our work load, we had a huge feed delivery mid-morning! Bad timing, the poor driver must have wondered why Dan and I weren’t ecstatic to see him! Anyway, several tonnes later it was all put away in the feed room and we still finished at lunch time! During the morning, Rupert, one of the younger horses, was having a “play” in the indoor school. He is very naughty on the walker and so is banned due to the probability of serious damage to the most important piece of machinery here! When I went to get him for his lunch, he certainly had enjoyed his time in there. Every jump pole was scattered at very artistic angles around the school. All the wings had been knocked over, the lunge reins had been thrown around, he had made a big hole for a good roll. But he had managed to roll a big plastic drain pipe we use as a jump up and down and that bit of the school looked beautiful!!! We had a very sad mid-week, the time had come to say good bye to our dear stallion Alaqhir. He was the most well-mannered and kind stallion. He was never difficult and has passed on his amazing temperament to his foals. He was born in the U.S.A. and was trained in Dubai. Al was very well travelled and went backwards and forwards across the Atlantic many times in his career. He ran 40 times and was placed 26 of those, running over a mile, turf and sand. We have 12 foals by him and the first of those is due to run any time soon. 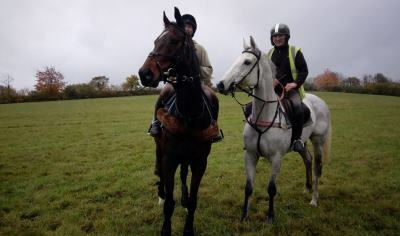 She is a 4 year old, un-named and we will run her in a point-to-point bumper hopefully and take it from there. Alaqhir’s legacy lives on, the colt we have by him born last summer, is stunning and probably one of the best we have bred. Al was a wonderful horse and a pleasure to have known, he will be missed. On a brighter note, Owners Day has started her new life. She was retired from racing. She has been very lucky and has gone to a fantastic new home, she will enjoy hacking around Dartmoor and competing in Racehorse Re-Trained classes. She has a great temperament and a lovely calm attitude to life. When Bryony was recovering from her injury in the summer, she always chose O.D. to take for a hack. It is always mixed emotions when a horse retires. You feel sad that all the hopes and dreams the owners have are not going to become a reality, the only fair option is to face it and call it a day. It doesn’t help owners, us, the jockey or the horse to keep trying for too long. Owners Day finished her racing career sound which is obviously great and because she has a lovely outlook she can go on and have a second career. We know she will be well looked after and have a happy life. This week we also had a surprise birthday party to attend. Very exciting but nerve wracking. For anyone that knows us, we are famously late for most things! The plan was for all his guests to be there at the venue before him… With a little stress we got there just in time. Not knowing the layout of the hotel, Jim and I crept from the bar, through the restaurant and around to the back of the building crossing all fingers we wouldn’t bump into him. We must have looked fairly suspicious, I’m surprised we weren’t thrown out by the door man! Well thank goodness, we found the room and joined all the other guests and we didn’t spoil the surprise. It was a lovely evening and great to catch up with lots of people we haven’t seen for a long time. We had a busy weekend with lots of visitors. The weather is beautiful at the moment and after they had met the horses, they took a drive over the moors. It was very funny as the wife of one of the groups, couldn’t help noticing my kitchen is still in the same state of dis-repair as last time she saw it! She was very good to point this fact out to Jim? I’m not sure even her bullying will make anything happen, there always seems to be something more important to do to the yard? I may surprise you all one day and actually just do it! I can’t keep saying “Please excuse the tiles behind the Aga, we’ve just had it put in!”. I’ve come to the conclusion my yellow labrador, Barley, will have to go on a fitness plan. He is gross! He goes to the summer gallops and plods up in his own time, stopping off at each water trough for a dunk! He can’t go to the winter gallops as it is near a busy road. So, do I get a bicycle or a pony? A bike is cheaper and it doesn’t need feeding! If I get a pony, I know I will want to compete again and I’m really not sure I have time to train a competition pony. Maybe, the answer would be to work out how to put Barley on the horse walker! And with that image I will end now!